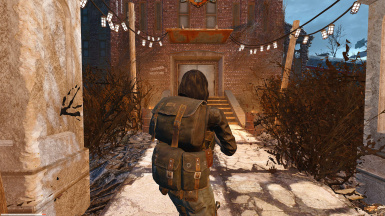 This mod adds craftable & upgradable backpacks & pouches. Horizon patch for AnS Backpacks Overwrites settings in WBaP, and the file is a master. 1. 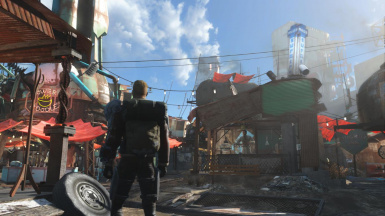 Use my assets in your mod and release it on Nexus, Bethesda.net, your tumblr/other social medias, or your own site. DO NOT put your mods that have my assets on apps/sites like ModDrop. Materials update for Survivor's Vest. 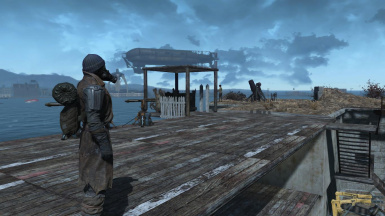 Completely rebuilt the mod, because of this past items will most likely disappear or change into another item, it is highly recommended that you get rid of any items from past versions. Before updating MAKE SURE YOU UNEQUIP ANY BACKPACKS FROM PREVIOUS VERSIONS AND SAVE YOUR GAME. 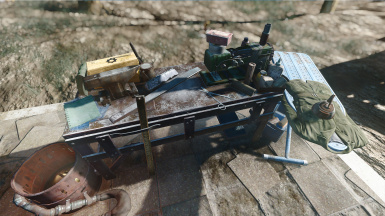 Added a new custom workbench with unique visuals that can be crafted at any settlements via the workshop menu, requires Armorer Perk rank 1. New workbench has recipes for many new backpacks and pouches. 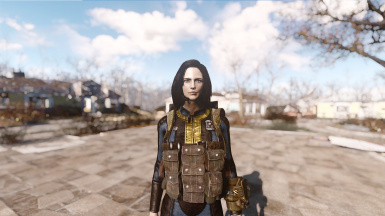 Added an in depth upgrading system to backpacks and pouches (these upgrades are accessed like any other vanilla armor at Armor Workbenchs found around the world). Changed from using slots 50, 51 and 61 to using slots 54, 55, 56 and 57. We have tested these slots and looked at the Fallout 4 records and haven't found any records of these slots being used but only time will tell! Please let us know if there are any issues! 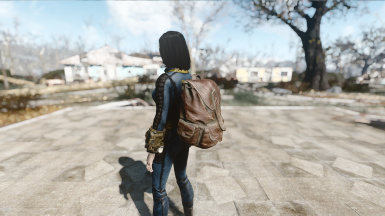 Traveler's Backpack - same visuals as from 1.3 but now has modifications that you can craft to add straps or increase carry capacity from 10 to 100 (60-100 requires perk Armorer 2). 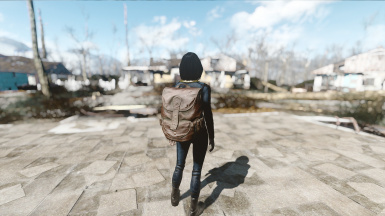 Wanderer's Backpack - Backpack from the Field Scribe outfit. Requires Armorer rank 2 to craft, has carry weight from 10 to 200 (110-200 requires perk Armorer 3). 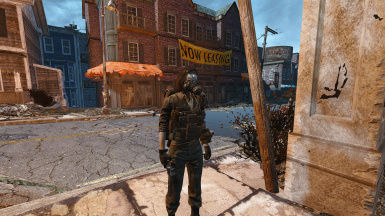 Modifications consist of adding straps and pouches to the front of your character. Venturer's Backpack - Backpack from child scribe outfit. Requires Armorer rank 2 to craft, has carry weight from 10 to 100 (60-100 requires perk Armorer 2). Survivor's Vest - Pouches from the Field Scribe outfit and optional straps with no backpack visuals. Requires Armorer 3 to craft and has carry capacity up to 50. Mercenary's Belt - Belt from combat armor, has optional canteen upgrades and colour choices, requires Armorer rank 1 to craft. Has carry capacity up to 30. Adventurer's Bandolier - Adds pouches under your characters arms, requires Armorer rank 2 to craft. Has carry capacity up to 20. 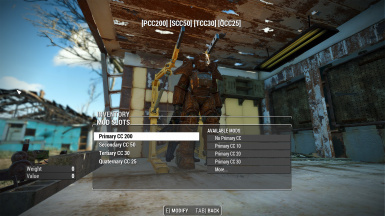 Added an optional .esp that allows you to craft a Power Armor item that add carry capacity to by equipping it to your power armor and upgrading it at power armor stations. This is a work around for Power Armors unequipping your armor which is a vanilla issue and not something we can fix at this stage. Added an optional .esp that allows you to craft ballistic weave on backpacks and some pouches when you unlock the ability to do so in game. Added an optional .esp that takes away the perk requirements for crafting. 1. Independent textures. 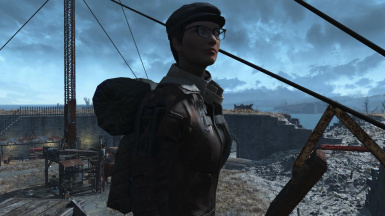 Updated retextures will no longer replace the original Traveling Leather Coat's backpack. 2. Backpacks with slot  (bandana slot) and backpacks with slot  (wedding ring slot). 3. All Carry Weight Variants for both slots to choose from. 5. All Carry Weight Bonuses for the strapless backpacks. To get backpack, still the same. You will see many Travel Backpacks (28 to be exact) with different "extensions" . [*]The one that has  extension, e.g. "Travel Backpack 5 CW ", this means that Travel Backpack adds +5 Carry Weight Bonus and uses biped slot 51 (the wedding ring slot). [*]The one that has  extension, e.g. "Travel Backpack 40 CW ", this means that Travel Backpack adds +40 Carry Weight Bonus and uses biped slot 50 (the Armorsmith Extended's version of Bandana slot). The vanilla bandana takes up too many slots; slot 48, 49, and 50. 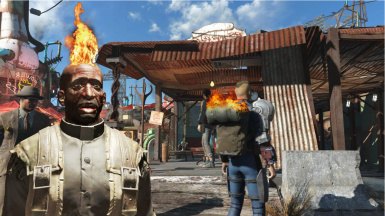 People who want to wear armor with gloves like Colonial Duster, Cleanroom Suit, Grognak's Costume, Kellog's Outfit and others should use this  type backpack. So you can just switch backpacks depending on your armor. [*]The one that has [S] extension, e.g. "Travel Backpack 30 CW [S]" , this means that Travel Backpack adds +30 Carry Weight Bonus, Strapless, and use biped slot 50. And the same with [S] extension. Backpack is assigned to biped slot 51 (wedding ring). No more grenade "bug" (throwable weapons use slot 59). Default carry weight boost is 7, with backpack weight 2, so it adds 5 points to carry weight. Added carry weight boost alternatives, download "Wearable Travel Backpack - Carry Weights" from optional section. It has +10, +20, +30, +40, +50, and +100 bonus to carry weight. Due to real life commitments, Stndmunki and I can't support this mod and have stopped development indefinitely. I just got back to gaming recently after not playing video games for 2 years, but I'm going to use my limited free time to play only. Thank you guys for the support & understanding. Gosh I should've put up this message sooner. If updating from 1.3, you must UNEQUIP YOUR BACKPACK FIRST AND SAVE THE GAME IN A NEW SLOT before updating. Otherwise you will find Carry weight Capacity bug. DO NOT upload my mods to apps/sites like ModDrop. Check out this german translation by commodore777. Check out this spanish translation by d4n13lus. I will add more retexture and patches links when they get updated to a new version. 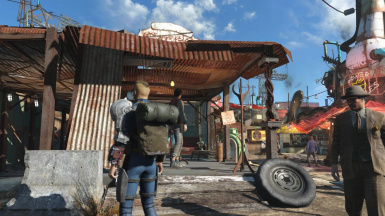 Adds 6 craftable and upgradable equipments with independent textures: Traveler’s Backpack, Wanderer’s Backpack, Venturer’s Backpack, Adventurer’s Bandolier, Survivor’s Vest, and Mercenary’s Belt. Strapless backpacks and removable straps. FOMOD installer and optional patches. 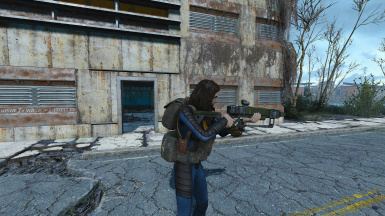 This is our current workaround for people who complain about Power Armor not stacking the Carry Weight Capacity buff (Backpack’s CC bonus disappears). 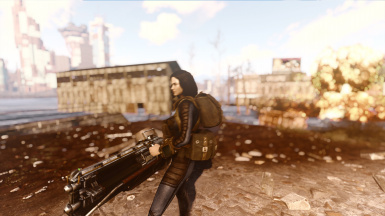 You can craft Carry Weight Capacity bonus mods for Power Armors (PA) at the Backpack Workbench and upgrade the PA mods at any PA stands. 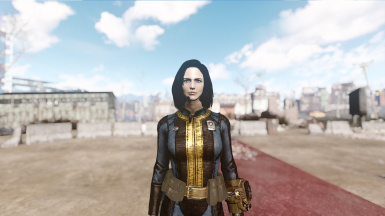 The mods are invisible, equippable as Power Armor part, and can’t be broken. Please understand that this is the only thing that we can do with current tools right now. (Traveling Leather Coat) covers the missing parts with some kind of scarf. By default it's the way it is.Can only be fixed by adding new parts on the model using 3D programs. Other equipments were made using alpha (making unnecessary parts transparent). You might find issues with decals & collision, e.g. when getting hurt while wearing Wanderer’s Backpack, blood decals will follow the shape of the original Field Scribe Armor. This is not a bug, this is what you get if you use alpha. The whole Field Scribe mesh is still there, I only made it transparent. In the next update we will have separated meshes. Stndmunki and I (and several bugtesters) have tested slot 54, 55, 56, and 57 and we didn’t find any conflicts with those slots. 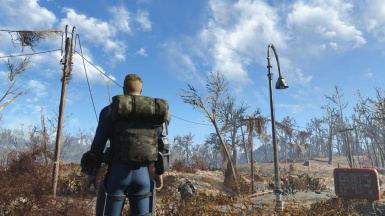 I was so disturbed when I found no wearable backpacks in FO4. 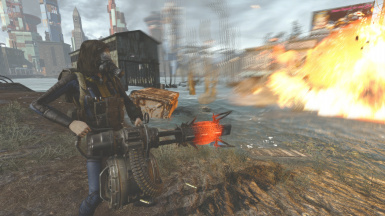 I thought after backpack mods for TES, FO3 & FO4, Bethesda would finally add some to FO4. I wanted to cry. I did actually, tears of disappointment and anger. Building settlements makes sense! Scavenging makes more sense than ever! But backpacks? Naaaah.... You have invisible pockets. 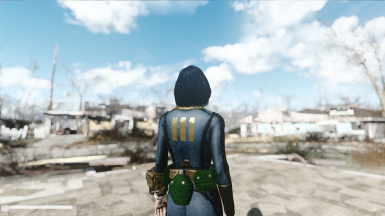 This is a simple mod that adds wearable backpacks to the game, "Travel Backpack" with carry weight bonus variants, and strapless versions of them. If anything, it's crudely made. I'm no professional modder, I could do armor mash-ups in Skyrim, but this is new. And this acts only as a temporary consolation, until an amazing modeler/modder in shining rainbow armor riding a multi-colored unicorn makes completely custom made backpacks *whistles. I'm saving my joyful tears for that moment. And of course for pizza. 1. Unequip your backpack and save the game. some for 5 minutes. Call/Kiss you significant other and let them know that they're more interesting than the game, and you justhave to do one more quest. (WHITE LIEEEEES ARE FINEEEE. SOMETIMES.). I knowit's a great game, but your body and your SO need your love too. And maybe your cats. And dogs. And dragon. 3. Uninstall 1.2, 1.2b, or 1.3 and patches used, using yourfavey fave manager. 4. Install Wearable Backpacks & Pouches using your fave manager. If you want to install manually, extract the archive to your Data folder, and enable the esp. 5. Install version 1.4b using your fave manager. If you want to install manually, extract the archive to your Data folder. 6. Fire up the game and pray to Godd(zilla) Howard it'llwork. It it doesn't, cry, call your parents and then do your laundry or something until miracle comes. I can't help prevent theapocalypse guys/girls. 1. Unequip your backpack, save game in a new slot, it's better than overwriting an existing one, quit the game. 2. COMPLETELY UNINSTALL Wearable Travel Backpack - 1.1 (or 1.0). - Any patches made by other modders. 3. Fire up the game, load the last save, there will be a warning saying some content is missing, choose yes. 4. Save game again in a new slot, then quit the game. 5. 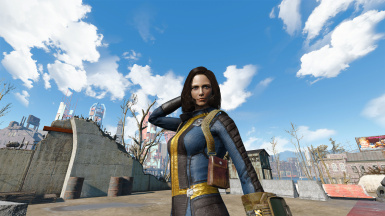 Install "Wearable Backpacks & Pouches"manually (Extract the archive to your Data folder) or using your fave mod manager. 6. Install version 1.4b using your fave manager. If you want to install manually, extract the archive to your Data folder. 7. Install new patches if available. Don't install old patches. Craft “Backpack Workbench” using the workshop menu. Craft the equipments using Backpack Workbench..
Upgrade equipments using any Armor Workbench. p.s. Console command (help backpack/bandolier/vest/belt 4) only works for basic equipments (the craftable equipments), you still need to upgrade them using any armor workbench for new features and CC bonus. understand that it’s possible that there are things that may still conflict. 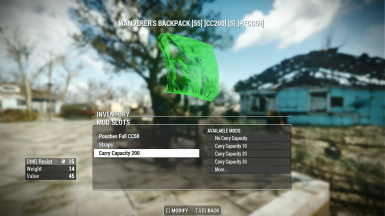 Thanks to Bethesda for providing at least one separate backpack mesh. Thanks Reddit guy, Jayfabs for testing. Thanks to Azrael_wtf for creating a patch for Crafting Workbenches. Thanks to Voivre for bugtesting. Thanks to lylesloudmouth for bugtesting and suggestions. Thanks to Varrgas for bugtesting. Thanks to BlandSauce for helping with mod list ordering.